It's autumn and we are preparing for some serious earth moving at our house. At the moment I have a very temporary type garden with lots of things in pots. Most of the plants were given to me by my friend Win when she moved overseas. I also have some lovely things I've grown from cuttings from my mother's garden, and some plants my inlaws gave me when they moved into an apartment. I have always been a bit of a skinflint but never more so than with my gardening - I try to do everything as cheaply as possible. The only downside is that plants don't always come with labels so I'm never sure what variety they are! 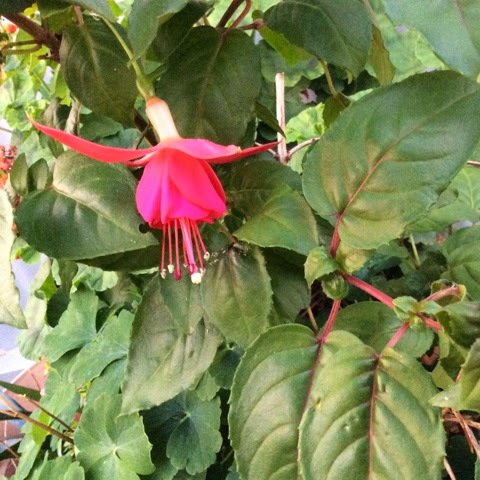 Here's a lovely fuchsia. I was waiting for ages for this one to flower so I could find out what colour it is. It's a double which is a bonus. 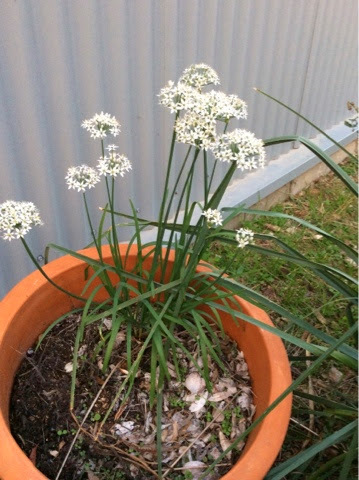 I think these are garlic chives. Here's my hydrangea that's planted in the ground by the tap. I buried the steel wool scourer under it when I planted it, in the hope that it would grow blue flowers. 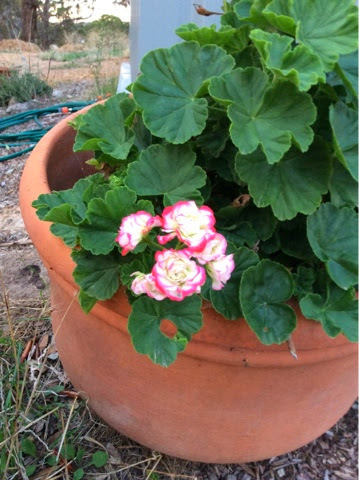 It was grown from a cutting so I wasn't quite sure. Turns out it has white flowers. Now in autumn it is turning a lovely shade of green with pink tinges. That's my rosemary at the back - very handy for the kitchen. This is a Lily, I think. 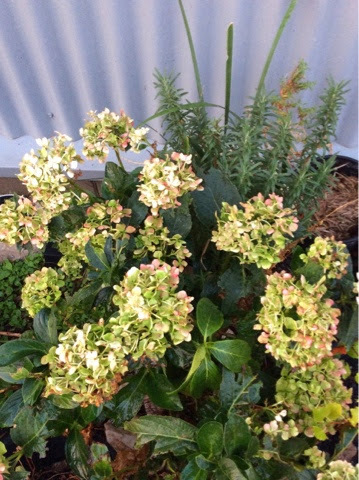 It has pink flowers and the leaves have yellow spots. 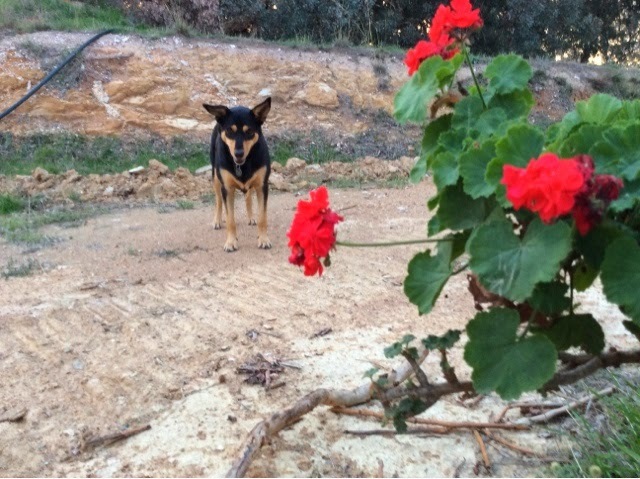 Now for some geraniums. 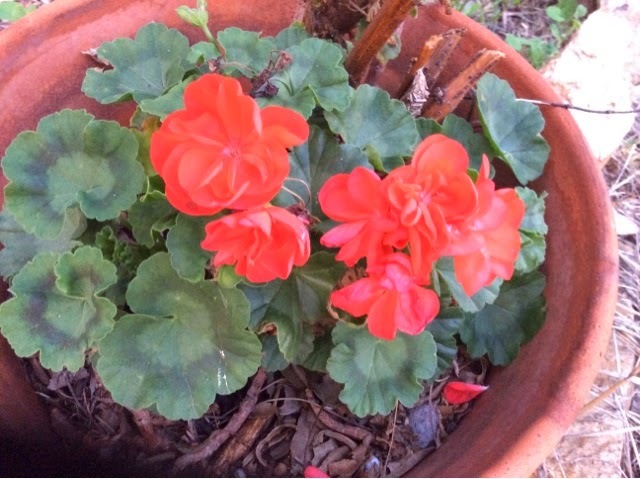 My whole life I detested geraniums. Mum always had a big collection and they seemed to me to be so common, and boring, and a shelter for snails. But I have come full circle and fallen in love with them. Here they die back in winter and need a drastic prune, then they flower right throughout the summer. They don't ask for much. Love this white and pink one. How sweet! Here's my pooch in front of the clay embankment that will one day soon be hidden by a rock wall. As you can see it's a bit dusty out there and when it rains the ground gets soggy and boggy. The PVC pipe running down it carries water from a tank up on higher ground. We fill the tank when needed with water from a bore which is down at the lowest point on our property. 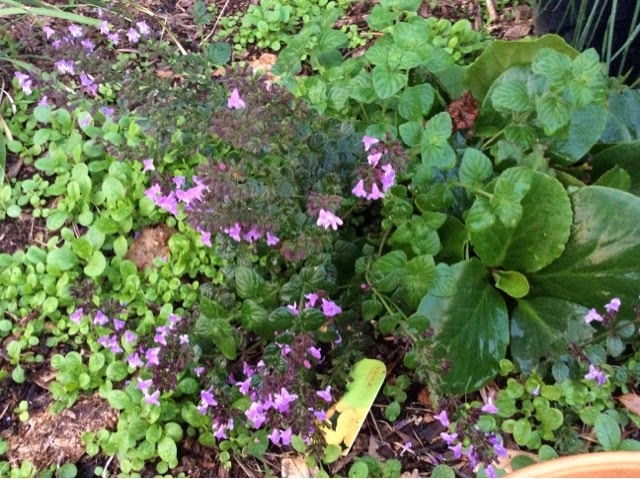 I did not take a photo of my favourite geranium, it's one with variegated ivy leaves and spindly salmon pink flowers. I forget what this purple flowered plant is called. But it spreads like crazy so hopefully it will cover up some bare ground eventually. 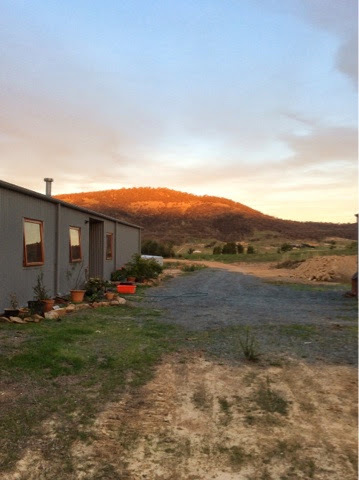 This is looking back along my garden bed, along the driveway towards Zoo Mountain across the valley. You can see some earth piled up on the right. That's going to be a garden bed, behind the stone wall, with a beautiful shade tree for visitors to park under. I'm not quite sure what tree to plant there. I'm leaning towards a golden elm. But I'm taking suggestions. 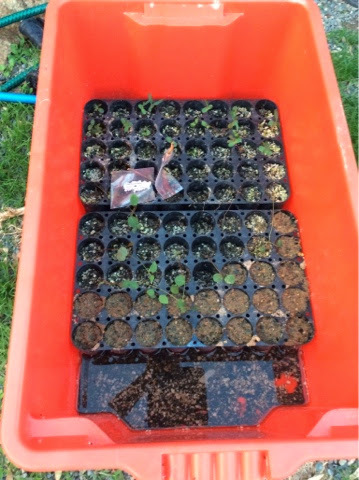 The big red box is a nursery for seedlings. At the back is hakea, in the middle westringea and at the front, under the sand are kurrajong seeds. I'm still waiting for those to sprout. 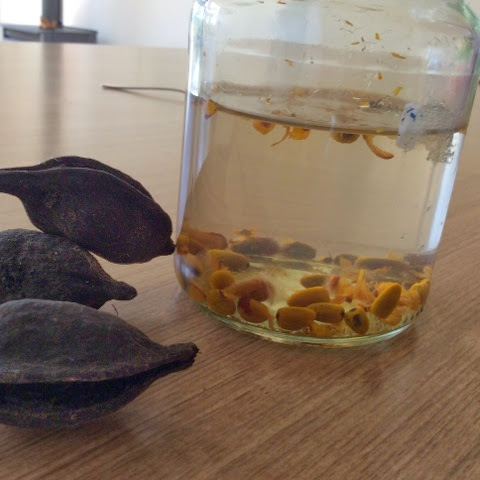 Here are kurrajong seeds soaking in boiling hot water. They look pretty much like corn kernels. The kurrajong is one of my favourite trees, but I'd better not go on about them too much. Lovely pictures of the flowers. I love hydrangeas. They dry beautifully and make wonderful wreathes. 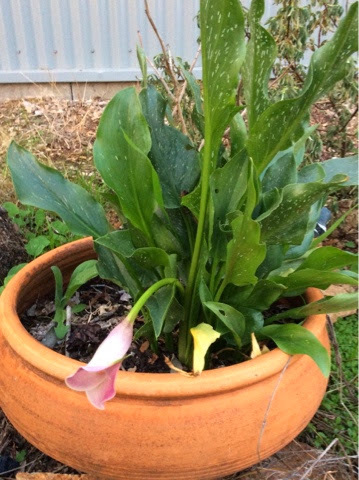 Since it's getting to be Fall in Au., will all the flowers be going dormant? So many pretty flowers. We have some of the same ones in our yard - geraniums, fuchsia and the purple one that spreads a lot! Love seeing the garden tour, Hannah. 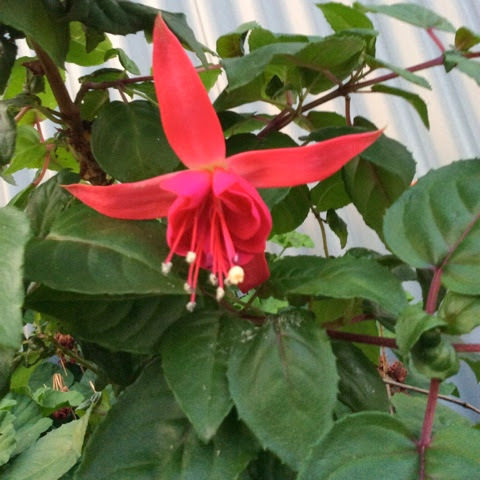 I love fuchsia and geraniums too and have both in my yard. Sadly, I lost the hydrangeas. I can't wait for our weather to be nice enough to have pretty flowers like yours! Your yard sounds lovely! You have a lovely garden! I did not run the race I was at my table promoting my painting classes. I am not a runner at all, however I love to walk.